Yellow Rice Recipe - making using a rice cooker can actually also be tablets, but there are still many who do not know. Food is often served as a rice cone when the first official or non-official. You can also eat in the morning if it is bored with pureed food, if every day of eating it continues then try to make yellow rice. 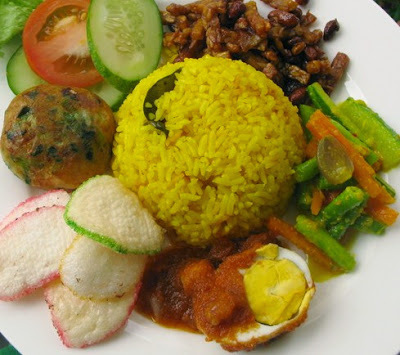 If eating yellow rice alone is sure to be bland so add some other ingredients such as eggs, some vegetables, crackers, fried onions and others. To how to make this the most easy and practical to use a rice cooker tablets. Bangetkan curious how bikinnya so directly refer to the following yes-style full recipe. Fried chicken, eggs, crackers, fried onions, shredded, cucumbers or tomatoes, fried tempeh and tofu. Put the washed rice into rice cooker, add water and spice paste. Put also lemon grass, leaves together and flavorings. Stir until the spices evenly with water and rice. Turn on the rice cooker and wait until the yellow rice cooked.